Nerdier than the McConaissance and less jarring than certain recent political shakeups is the sharp change in podcast listening over just the past couple of years. Owing much to breakout hits like Serial and Welcome to Nightvale, the podcastaissance has affected the way we consume news, learn, and entertain ourselves. It has also affected the fate of today’s featured nonprofit, Atlanta Radio Theatre Company. Though the Company’s been around for 30 years, and has podcasted for more than 10, podcasts’ rising popularity has gone a long way toward building this Atlanta non-profit’s reputation on a national scale. Last week I spoke with David Benedict the full-time Vice President of ARTC (“artsy”), . David has been in theatre since high school. After college, he left the stage moved to the “front of house” to manage local theatres. While he loved storytelling, his commitment to stage performing was lukewarm. Until Dragoncon 1994. At the”the world’s largest sci-fi/fantasy convention,” David saw ARTC’s performance listed in the program. That year they were doing an adaptation of the HG Wells’s Island of Doctor Moreau, a story about a scientist attempting to surgically turn animals into humans. 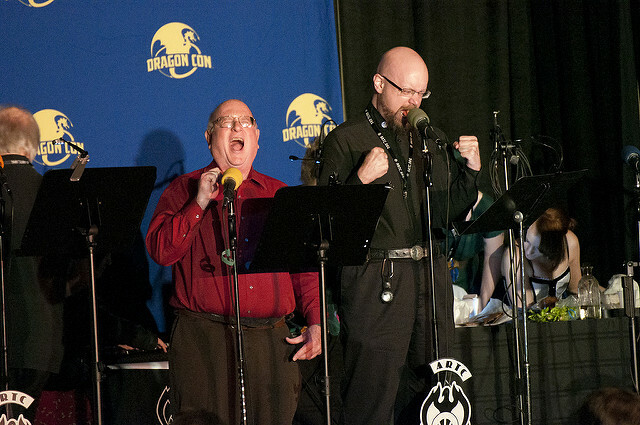 David and ARTC member, Ron Butler, perform at the 2015 Dragoncon. ARTC creates story presentations in style of radio drama but still perform on stage. All actors hold scripts, and costumes are spare, but there is a live audience. What viewers lose in blocking they gain in film-quality sound design – forks clinking against plates, doors sliding open and clicking shut, mood music and cats purring. “After they did the show I went over and asked ‘how do you join this thing?’ and the guy was like ‘no one has ever asked us that,'” David said. But for David, this performance style was a perfect fit. 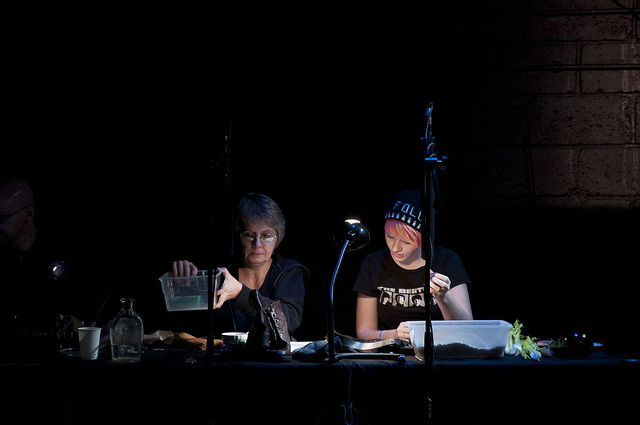 He also liked the technical side of ARTC’s art form – the sound effects and working with musicians. Now, more than 20 years later, David is an ARTC leader. He recently left a job at the Georgia Aquarium to commit full-time to the organization. 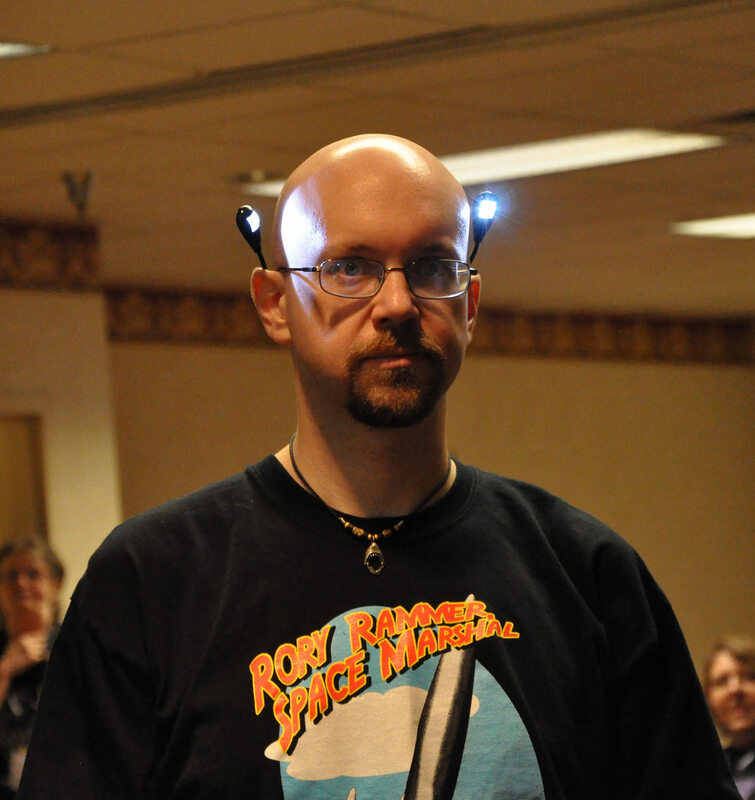 David Benedict in costume as Rory Rammer, Space Marshal. While horror, sci-fi and fantasy are their “bread and butter,” ARTC performs stories from almost any genre. For while it’s a non-profit, the Company can’t completely succumb to the whims of its writers’ muses. The downside of the podcastaissance is that it’s not inherently profitable – money comes from advertising or product sales. ARTC has seen a boost in its listener base in the past few years, and the advent of Patreon – a startup that allows artists to raise money from their fans – has helped cover their basic costs, but not much else. So the Company also sells popular performances on audible.com and in DVDs to make ends meet. The snake is a piece of audio equipment, unfortunately. At the end of each podcast, David tells listeners that the most powerful gift they can give ARTC is to tell friends and family about the Company. Even if the listener isn’t in a position to donate, a friend or family may be. New “Davids” come to the Company in a variety of ways. But their recruiting tactics have grown since Dragoncon ’94. “There’s a surge in appreciation of good storytelling,” David said. But, he added, audio drama is still not yet produced on a mass scale. In order to grow, ARTC has gotten creative with their recruitment techniques. “For many years, at live performances we’d say ‘if you’re interested in joining, come on in.’ [But] in the last year, we’ve started hitting up local music and audio engineering schools,” he said. Since spoken word isn’t a major sector of the sound industry, many of these students are trained exclusively in music. Those who have garnered an acting position with the Company are not all professionally trained either. Some are stage actors, and others are film, David said. Still others do radio theatre as a hobby. One of ARTC’s best actors is a civil engineer by day. ARTC, may the podcastaissance be with you.